STAFFORD TOWNSHIP, NJ -- Authorities say a small plane carrying students from a skydiving school made an emergency landing on a southern New Jersey highway. No one aboard the single-engine plane or on the ground was injured when the plane touched down Sunday morning on Route 72 in Stafford Township. Authorities said the plane apparently lost power shortly after taking off from a nearby small airport. But it's not yet known what caused the problem. 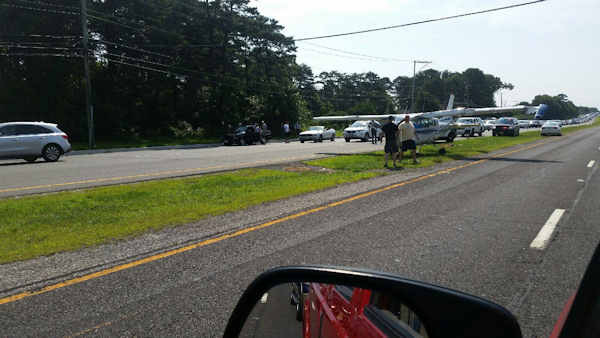 Besides the pilot, three skydiving students and an instructor were aboard the plane. Their names have not been released. Some traffic was delayed in the area, though no major issues were reported. Route 72 is one of the main roads between Philadelphia and the Jersey shore.